Exhibition at Lidingö Museum about Boghammar's marine, May to October 2019. My father was sailing the Atlantic and Pacific oceans during the WW II (have a look here) and of course he must have his own boat later when he landed in Stockholm, Sweden. After 19 years this dream became true and he bought the cruiser Monalisa. A big boat at that time, 1964. If I remember correct he paid 200 Euro for this boat, 48 years old at that time, that was a price that attract not so rich people and our family was not very rich. My father's cruiser Monalisa has a typical C. G. Pettersson look. It could have been built about 1916 according to Christoffer who own a sister boat to Monalisa, that's almost ten years earlier than I thought. Maybe built at Lidingö in Stockholm by Gustafson and Anderssons shipyard, at least Christoffer thought his Ingalena is built there. The length of the boat was just over 9 meters, the width not more than 2 meters and it was entirely built of mahogany. When I have looked for information about C. G. Pettersson boats I have seen there are more then Pettersson that designed boats with a look like this. I have listed some of my sources of information below here. You can easily recognize a C. G. Pettersson designed boat, long and very narrow wooden boats. Ritning, C. G. Pettersson ritning 505. Båttyp: motorkryssare, Längd (meter): 9, Bredd (meter): 2, Maskinstyrka: 17-25HK Sterling. In January 2019 I found this, there is a constructor with name Victor (sometimes spelled Viktor) Israelsson that make drawings that look very C. G. Pettersson like. When investigating in more detail I found a drawing from 1914 that is almost an exact copy of Monalisa. In the information on the drawing I can read that this drawing is based on an earlier drawing from 1913. Båttyp: Motorbåt, Längd (meter): 9.25, Bredd (meter): 1.94, Beställare: Törnqvist, J. K.
This was a real surprise, was not my father's boat Monalisa designed by C. G. Pettersson? According to the drawing I found here it must be a Victor Israelsson design. I still think it's correct to say that Monalisa is a Petterssonboat because it looks like a Petterssonboat. It must be that Pettersson and Israelsson had some kind of cooperation, otherwise the design hadn't looked so alike. Now the tracks seem to lead to Victor Israelsson who has designed my father's boat. I decided to make an attempt to get hold of those living relatives of him today. After quite tricky searches I got out the family and I am now in contact with a granddaughter of Victor. She has been told about her grandfather Victor and knows that he designed boats. Gideon Forslund's look a like Pettersson drawings don't matching Monalisa. The drawings of Ruben Östlund's boats are very similar to Pettersson's drawings but I can't find any drawings matching Monalisa. Ruben later designed boats with a more speedboat design hulls. Knut Ljungberg's drawings are also very similar to Pettersson's, but not as many and more exclusive. No drawing that looks like Monalisa. 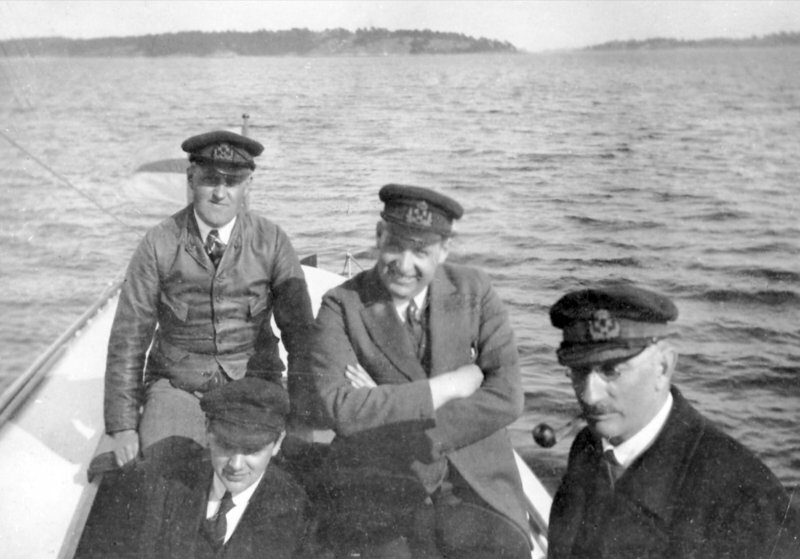 Gustaffson and Andersson's shipyard let built many C. G. Pettersson and Victor Israelsson designed boats among others. "He built about 10 boats with length 8 to 10 meters, maybe eight of these were of C. G. Pettersson design". I found an old photo from 1930s on his web page with a C. G. Pettersson boat at his shipyard with a very similar design as Monalisa. Built Israelsson's boats, Erik Rudén Rosenvik, Stockholm. I started this research about Monallisa1998, now it is twenty years since then and still I found new information. Continue to page 2 and read more.